Advanced Vray HDR Setup & Settings for 3D Renderings. This is a more advanced version of a Vray and 3DS Max HDR lighting setup. 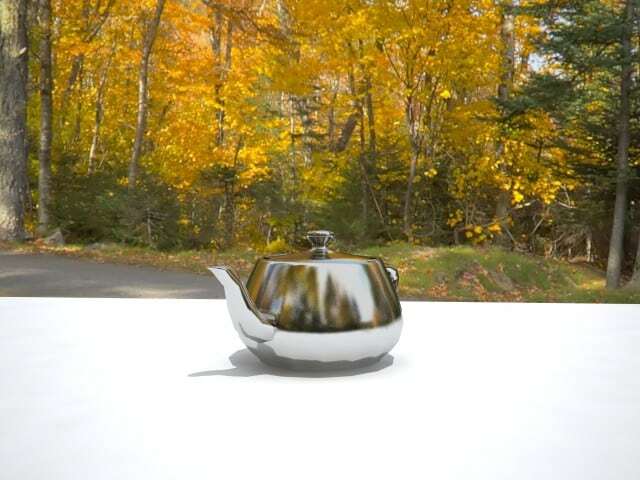 You’ll obtain better images with this method rather than using the standard HDRs alone. The previous basic tutorial used a single HDR for everything. Now, I’ll show you how to “split” the High Dynamic Range images so that you’ll achieve better looking results. Also, the rendering process itself will be more efficient in terms of memory and processing. However, it does take more time to set up and that is why I generally skip the first two VRay tutorials listed here. I tend to use the sIBL application instead when it comes to VRay as it automatically takes care many of the HDR steps below. However, if you don’t use sIBL and are just getting used to using HDR images in general, you may find this information helpful. Review Steps 1 – 8 of the previous tutorial if you haven’t already. 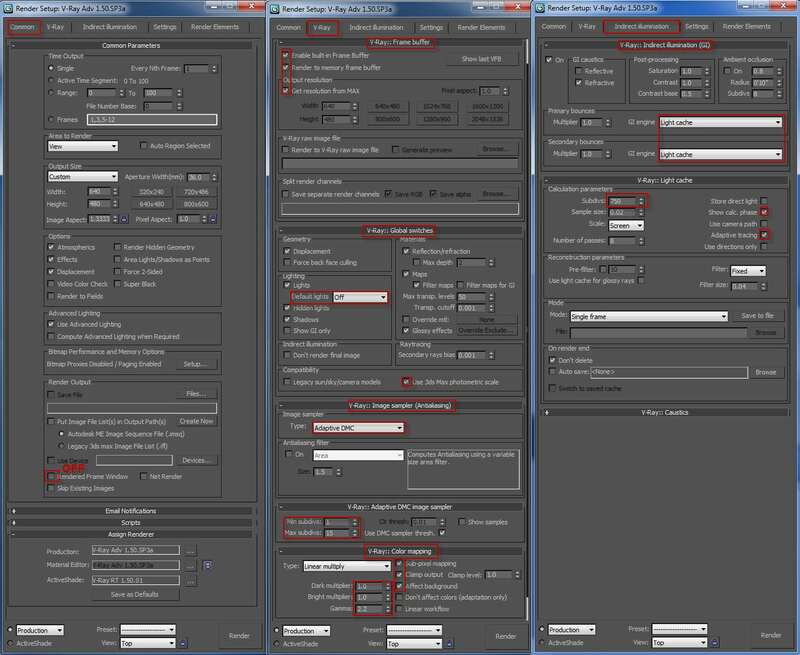 1) We will add the HDR to several different slots in the Render Setup window. Open the Render Setup window: /Rendering/Render Setup. There will be a tab called: Vray Environment. Open that part and where it says GI Environment (skylight) override and check the “on” button”. Where it says none, browse to your HDR file. This instructs the 3D program to light your model with this HDR file. You don’t need a large HDR to light your file. You can save memory and processing by loading in a smaller version/copy of original HDR that is blurred. In this example, I used a 137 KB HDR that’s been downsized from the original 8,000 x 4,000 pixels to 360 x 180 pixels. This was blurred in Photoshop then resaved with a different name by appending “*_Env.hdr”. Compare this to the 88.3 megabyte file which many, if not most people would use! Of course, you could just use the original HDR instead. In a more complicated scene, your rendering times may be impacted and even lead to system instability. 2) Now, you’ll want to do the same to the Reflection/Refraction Environment Override. This time, we’ll use a much smaller resized version of the original HDR that isn’t blurred. In this case, I’ve resized the original HDR down from 8,000 x 4,000 pixels to 1,500 x 750 pixels. It’s renamed with the suffix “*_Ref.hdr”. The file size is now 3.4 MB compared to the original 88.3 megabytes. Again, you don’t have to do this if you don’t want to. You can still use the original file. 01-02. Vray Environment Override Settings. 3) Navigate to your main Environment window /Rendering/Environment. In this example, I’ve saved a tonemapped version of the original HDR out to .jpg format. I’ve kept the image size 8,000 x 4,000 pixels, however the file size is drastically smaller while remaining crisp. This will be your background image. With the libraries on the HDRSource website, you can simply use the tonemapped .jpg files which are provided. 03. 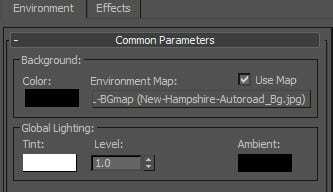 VRay Background Environment Map Settings. 04. VRay Test Rendering Settings.